Brant Guilfoyle is a Personal Care Assistant (PCA). 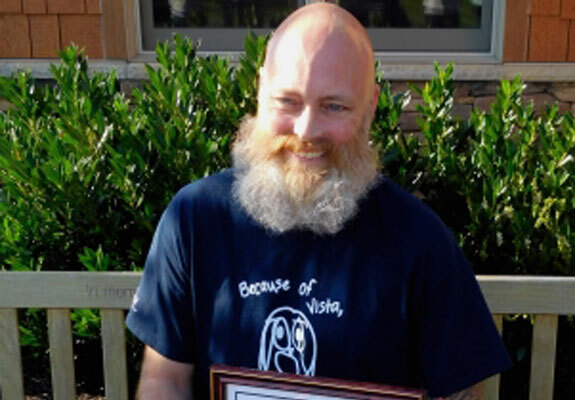 A 10-year Vista employee in 2016, he was honored with a named brick in the patio outside The Vista School main entrance. My current position as a Personal Care Assistant (PCA) is to provide assistance and support to not only our students, but to staff as well in the safe management and response to undesirable behaviors. It was more serendipitous than anything. I had been recently hired for a granted position with another social services entity. When I was informed that the position was put on an indefinite hold, I needed a job, and Vista was hiring. Ten years later, I am still here. I’m going to say meeting my wife for my favorite part about my job. That and it is never lacking of a challenge, both mentally and physically. I can honestly say if this was a boring place to work, I wouldn’t have made it 10 years. I spend most of my spare time chasing after my daughter. But when I do have a moment, I enjoy cooking and kayaking/camping.